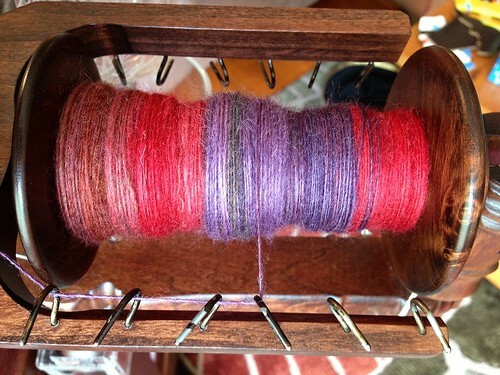 Well, I failed miserably at my Tour de Fleece goal this year (ie, to spin for at least 15 minutes every day of the tour), but I did get more spinning done than I expected to. I finished spinning and plying the 6 ounces of Corriedale/Nylon Cupcake Fiber Co batts and I’m very pleased with the resulting yarn. It’s probably a DK weight and is a true 3-ply. Not sure what this will end up as yet. 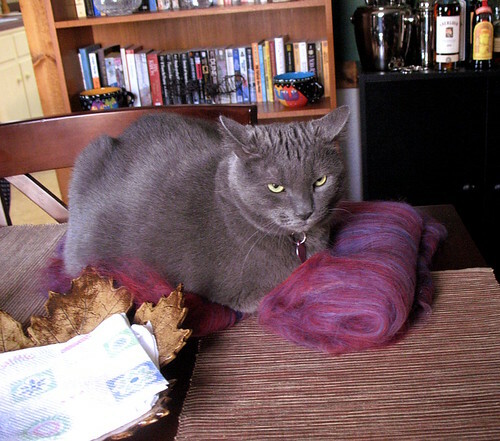 I also started spinning the braid of Bluefaced Leicester that I had dyed years ago and which had been in my stash forever (Griff chose that one over the green and brown superwash Merino I had also picked out). The fiber was very compressed from being in storage and stuffed into various moving boxes, but it fluffed up nicely and is spinning up well, all nice and shiny and BFL-y. Once I finished the toe-up handspun socks I had been working on, I immediately cast on another pair with some more stashed handspun. 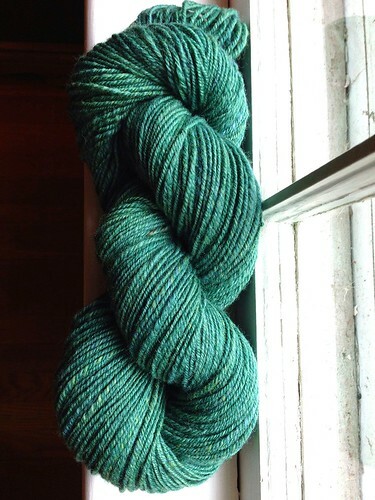 This yarn was spun several years ago from a batt that Michelle carded for me. 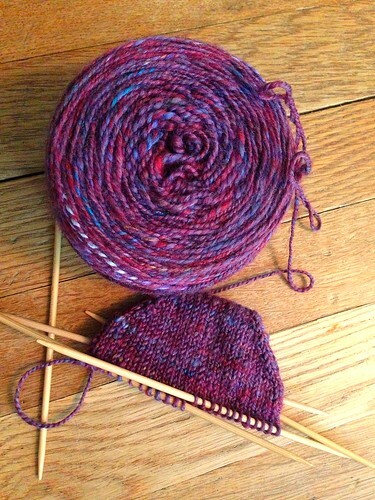 I seem to recall that she added some bamboo to the mix with the thought that it would make a nice strong sock yarn. Here’s a photo of the batt, with naughty Shastes using it as a pillow (RIP, little Shastes). And here’s the progress so far.